Home > Cordless Phone > P-P303 : 3.6 volt 400mAh Ni-Cd battery pack w/ White connector for Cordless Phones. Fits MANY Cordless Phones. P-P303 : 3.6 volt 400mAh rechargeable Ni-Cd battery pack w/ White connector for Cordless Phones. 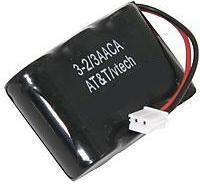 These battery packs are manufactured in the USA with premium-quality Ni-Cd cells. Fits Uniden, AT&T, V-TECH, GE, LUCNT, NOMAD, CASIO, RCA, Bell South, & many more ! Compatible the following OEM battery model #s: AT&T 4051, Battery-Biz B-702, BatteryValues B-702, Bell Equipment TL6155, Bell South 59768, Conair 59768, DSMiller B-702, DRCB12, Dynacharge NC-T2/3AT, Empire Scientific CPB-403D, Energizer P3303, FIC CPB-40D, Gemini TA246, Gold Peak GN-3-1/2AACA, GP Sylva Charge GP270AA3BMJ, Hi-Capacity B-702, Jasco TL-6155, Lucent 4051, Lucent P-03/F3G62A, Panasonic P-P303, Panasonic P-P303PA/1B, Panasonic RCT-3B-C2, PM Battery TL6155, Power Battery TP-3 1/2AAT-WA, Rayovac CO100P3, Saft STB-122, Southwestern Bell 560506, Telepower TP-3 1/2AAT-WA, US Power BCO1011, V-Tech 80-5074-00-00, V-Tech P-3303, Varta VIP105/16301, etc.